Using college statistics, combine performances and even high school recruiting rankings, I fitted a multiple linear regression model that predicts the peak NFL receiving yards that a player will reach in the NFL. Peak NFL receiving yards was used as the response variable because it limits the effect of injuries and career longevity, and it is a good measure for how prolific that player was at his very best. All of the data that was used to build this model came from pro-football-reference.com and espn.com. Our sample consists of division 1A wide receivers (sorry Adam Thielen) who attended the NFL combine and played in the NFL since 2000. As a first step, we looked at the relationship between college and NFL statistics. 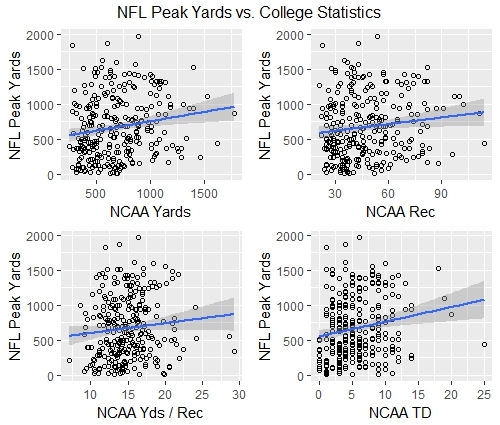 The plots below show stats from a player’s peak college season on the x axis versus that player’s peak NFL receiving yards on the y axis. Just as we would expect there is a positive correlation between all of these stats and peak NFL receiving yards. It turns out that wide receivers who were good in the NFL were also pretty good in college as well. Crazy, right? While all of these relationships are relatively week, NCAA touchdowns is the strongest predictor of NFL peak receiving yards with an R^2 of 0.028. This could be because touchdowns are a better indicator of a player’s big play, or “home run” ability then just yards or catches. It could also be due to the fact that coaches tend to call more pass plays near the goal line when they have an elite wide receiver on their team. On the other hand, none of the drills at NFL combine have a significant relationship with peak NFL receiving yards. Given how much attention the NFL combine gets, I would have expected to see the numbers from these drills have more predictive power on NFL performance. There is a slight negative correlation between peak NFL yards and 40 time but this is very week (p-vale = 0.65). 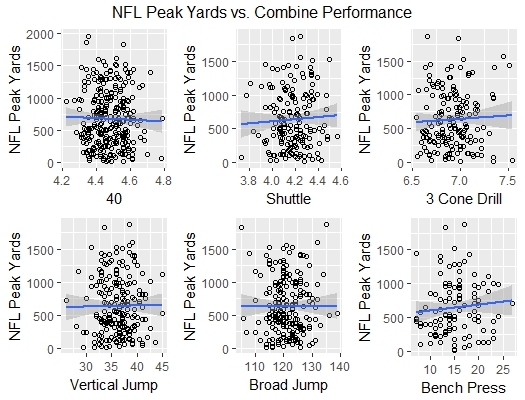 None of the combine drills have a significant relationship with NFL peak receiving yards. 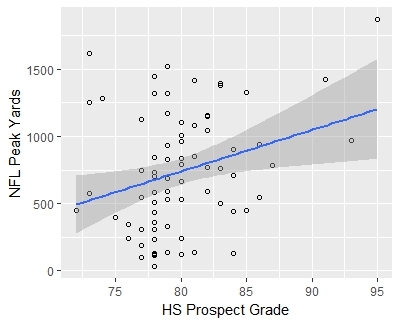 By far, the strongest explanatory variable in our data was the high school prospect grade from ESPN.com. Many wide receivers who have done well in the NFL were also highly regarded high school recruits. The plot below shows the relationship between ESPN.com prospect grade and peak NFL receiving yards. Unfortunately, many NFL wide receivers were not ranked at all in high school. I accounted for this in the model by also including a binary (1 or 0) variable for whether or not a player was ranked. In the end I settled on a model that incorporates NCAA yards, NCAA touchdowns, prospect grade, and broad jump from the NFL combine. The table below shows the projected peak NFL yards for the wide receivers entering the 2018 NFL draft. Check out how our model has done on prior drafts in the table below. These predictions were calculated by removing a draft year from our sample, refitting the model, and then using the model to predict peak NFL yards on that year. Keep in mind that some players drafted in recent years likely haven’t reached their peak NFL receiving yards yet in their career.